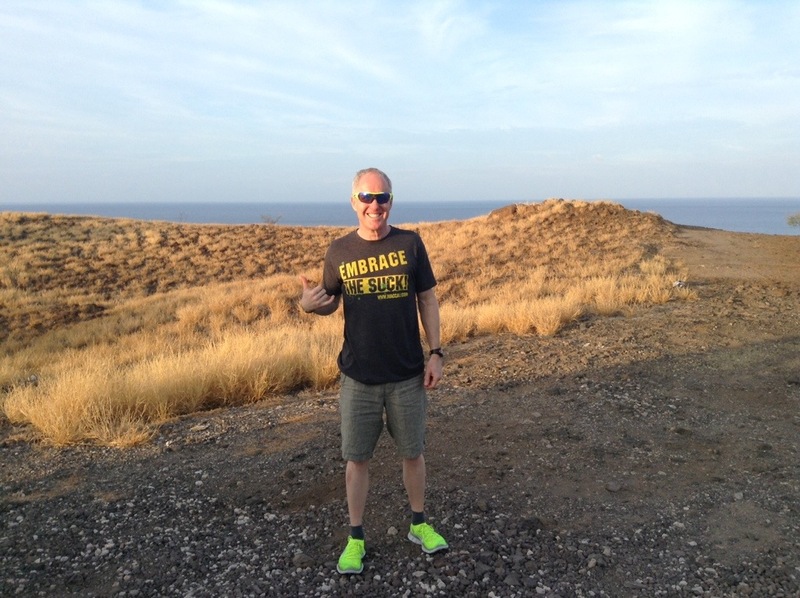 For anyone who missed the memo, I’m a big fan of Hawaii. 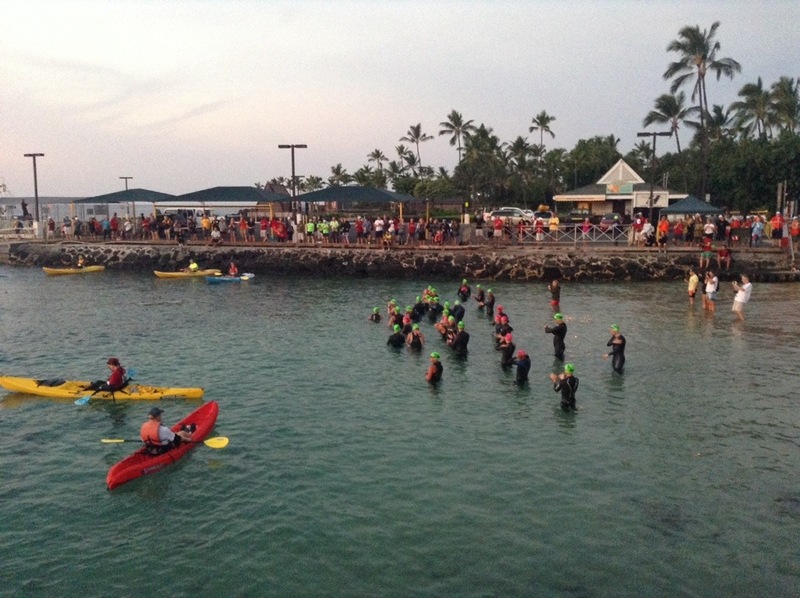 My wife covers the state extensively in her travel writing career, and I often go along and/or drag her to races over there, particularly the Ironman in October and its affiliated half Ironman in late May / early June. 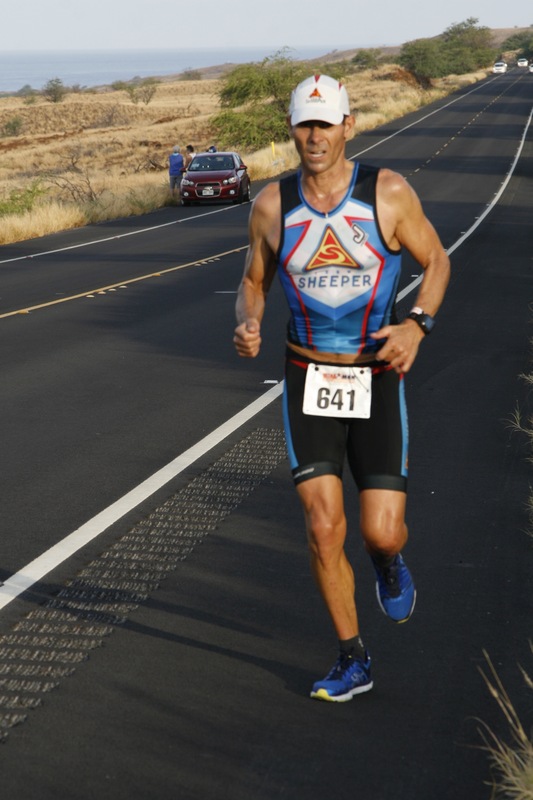 So when my friend and coach Tim Sheeper told me his midlife crisis-driven “Aloha Triple” — the three big world championships held in Hawaii (the Ironman, Xterra and Ultraman) — well, I wanted to be part of it. 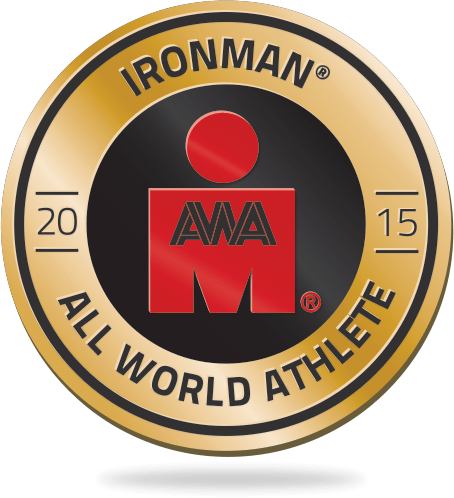 I was part of it already by virtue of having qualified for this year’s Ironman, and Tim qualified easily by winning his age group in Ironman Coeur d’Alene. 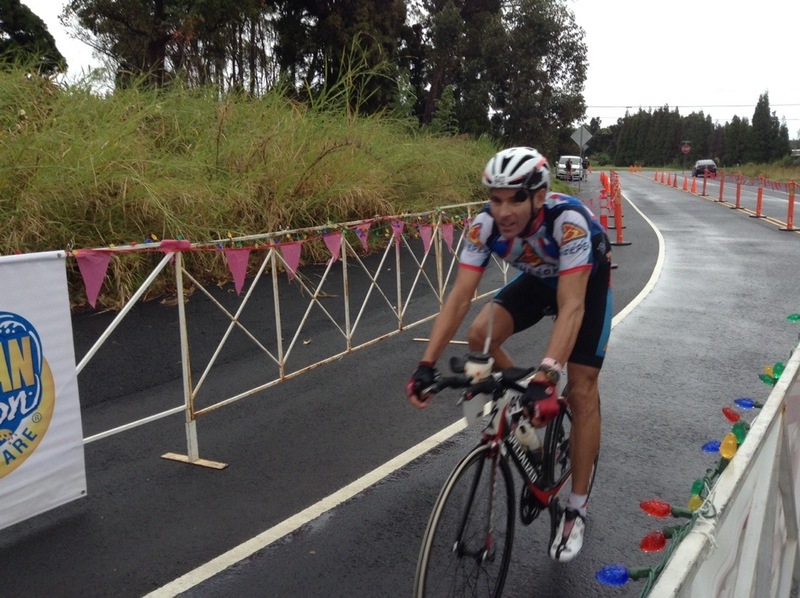 At Kona, he had what for him was a so-so race, going 9:45:13 for 11th in the M50-54 age group. 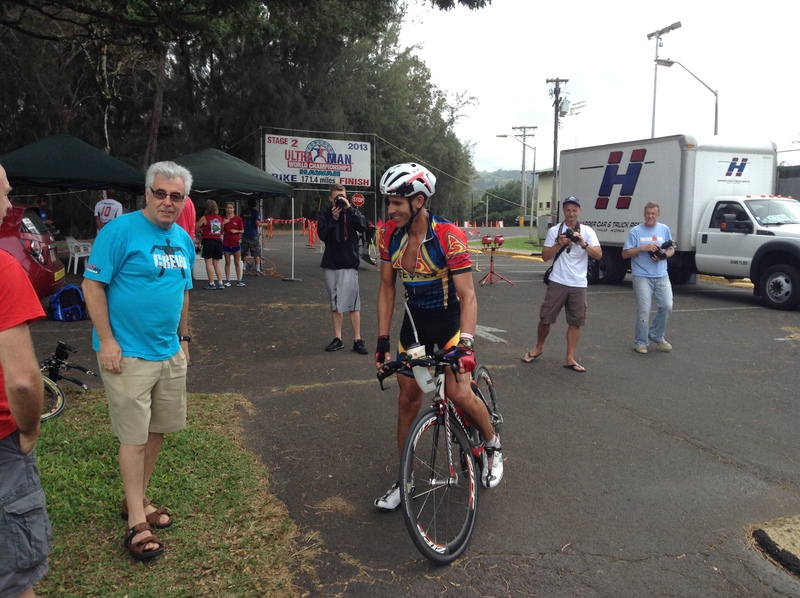 At Xterra, he won the M50-54 age group on a borrowed 29er hardtail. So all that was left was this little event called the Ultraman. Here’s where I really got my chance to be part of the Aloha Triple. See, Ultraman is the opposite of Ironman. 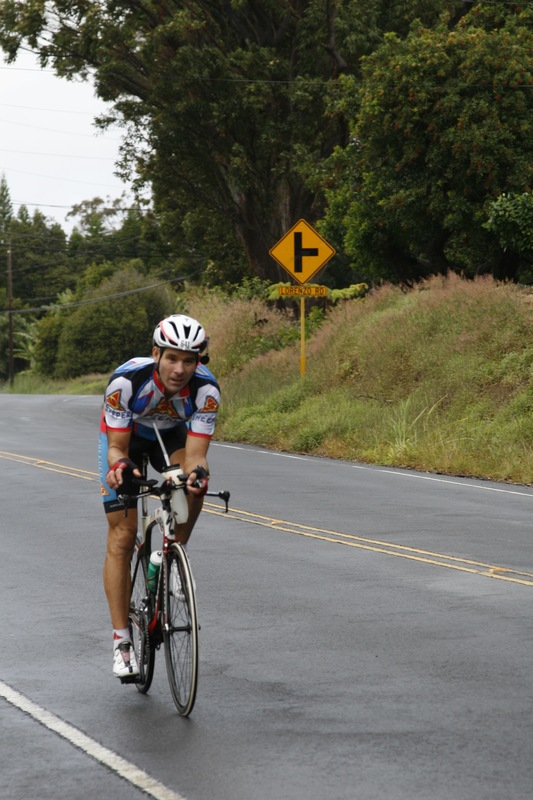 Instead of 2000 Type-A racers taking over Kailua-Kona and the Queen K highway for more than a week, Ultraman has roughly 35 competitors, doesn’t close any roads, and has no aid stations. 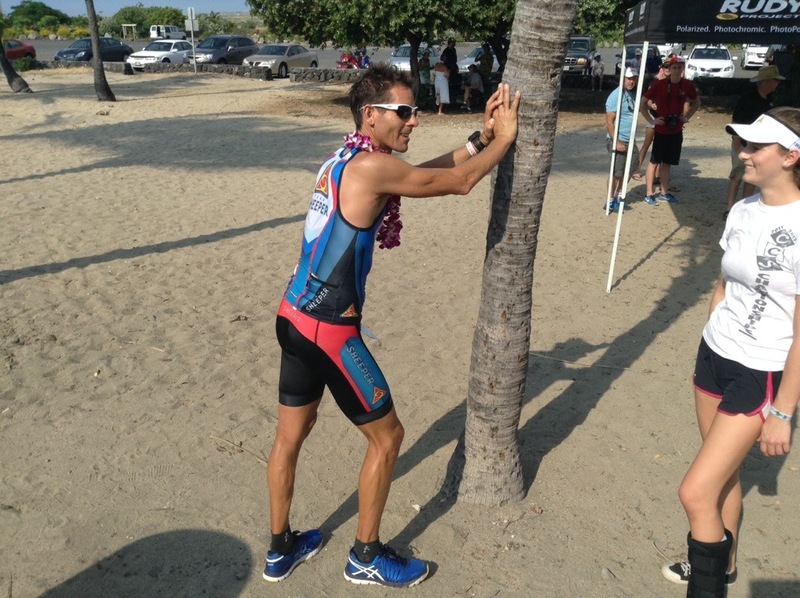 Each athlete is completely supported by his own crew, from a guide kayaker on the swim to a van that acts as a mobile aid station, leapfrogging the rider to hand off food and drinks and anything else the rider needs. Tim’s support crew consisted of me, Keith Terada (another Team Sheeper guy who’s also done Kona in the past), Bruce Smith, a swim and triathlon coach who did Ultraman back in 2001 (got 4th overall), and Sierra Sheeper, Tim’s eldest daughter, who was on crutches after a powderpuff football mishap. We bonded very quickly and worked out the division of labor. 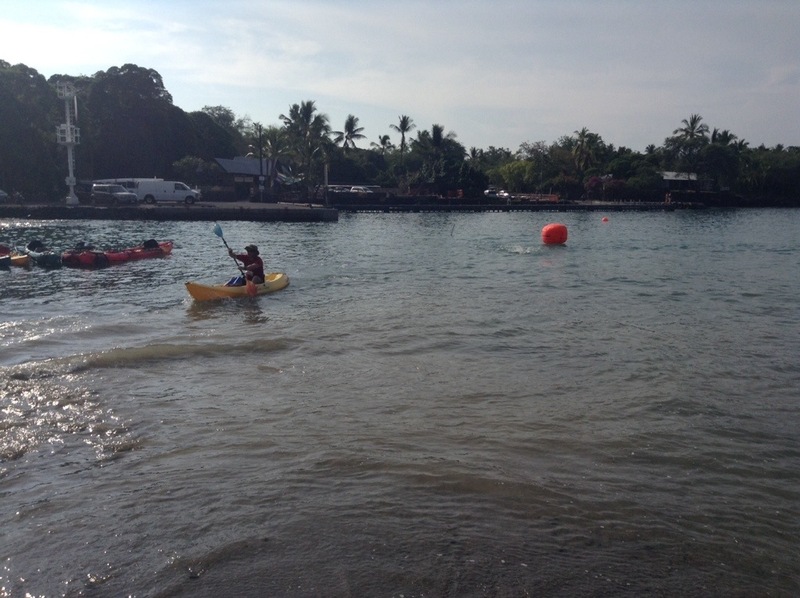 Keith was the paddler who accompanied Tim in the swim. Bruce drove the support van on Days 1 and 2; Keith drove on Day 3. Bruce and I planned to pace Tim at various points during the run. Sierra mixed nutrition, filled bottles and sorted food. All of us handed Tim foods and bottles, which is easy on the run but not so easy on the bike, especially when Tim is flying by at 25 mph. 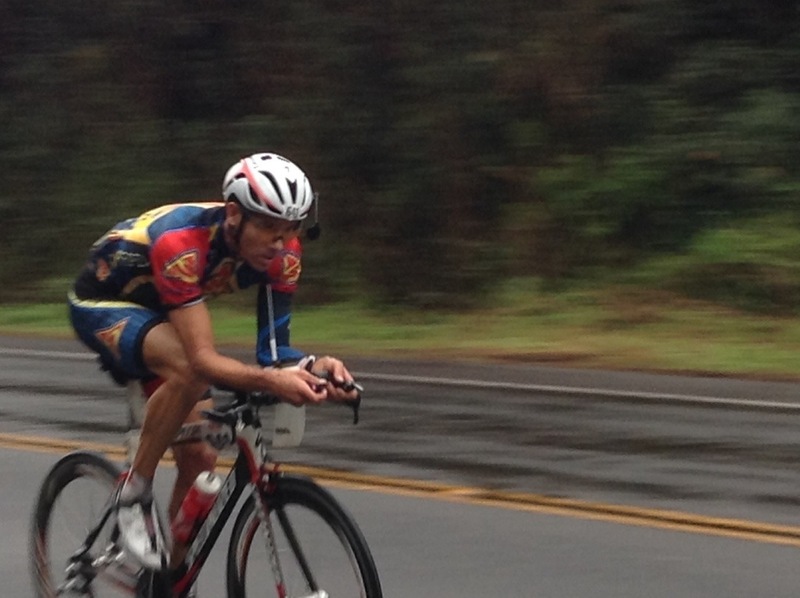 You basically have to do a full-on sprint while holding a bottle or banana out for him to grab. Sometimes it worked, sometimes it didn’t. Day 1 was fantastic. Tim came out of the water 2nd, 10 min behind Hillary Biscay, whom Tim coached back when she first started triathlons (she was a collegiate swimmer). But Tim passed her about 20M into the 90M bike, so we were on our own after that – we didn’t see another team the rest of the day. 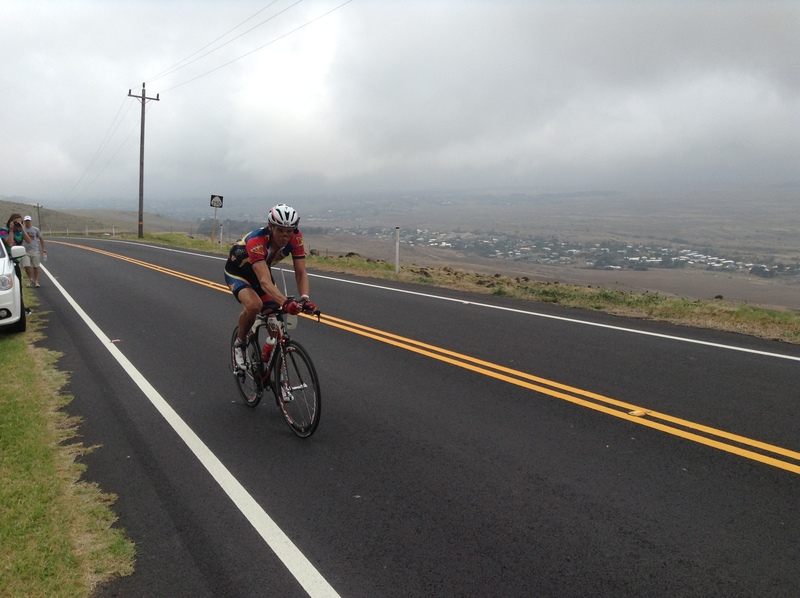 The elements were tough: headwinds, crosswinds and pouring rain, plus a final climb of almost 3000 ft up to Volcano and the finish line. But he ended the day with a solid lead over his rivals, which put a big target on his back for Day 2. The course on Day 2 is fantastic – you get to see the side of the island that most tourists never go to. 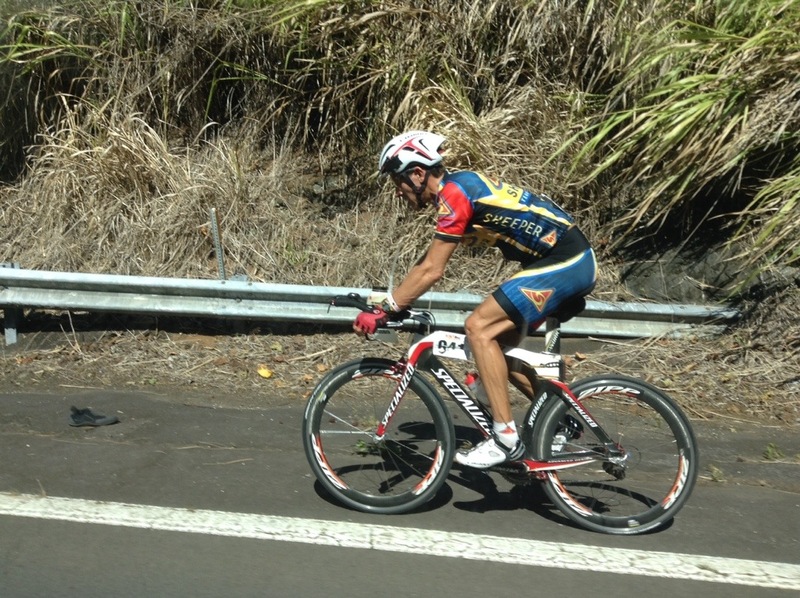 But it’s 171 miles, the first 100 or so of which is pretty fast — there’s a big 25M downhill to start, and then tailwinds through Hilo, so Tim hit the Ironman mark (112M) in 4:48 — that’s fast! His rivals were all there and pushing the pace hard. Coming into the Day 3 run, bear in mind that Tim didn’t have the kind of lead he’d hoped for after Day 2. His two closest rivals, Alexandre Ribeiro and Miro Kregar, were 16 and 31 minutes back, respectively, but had much better Ultraman running resumes than Tim’s lone 7:24 time from 2007. So, given that, the plan was to run steady and not only make Miro and Alexandre come and take the remaining time off of him but also let them try to destroy one another and see if one or both paid for it in the second half. Part of the plan worked — Alexandre cracked, for I believe the first time ever in Ultraman. Not that surprising considering how fast those guys went out — we heard some hard breathing when they passed mile 2, and there were still 50.4 to go! The first 13.1M for Tim was 1:40 and change. 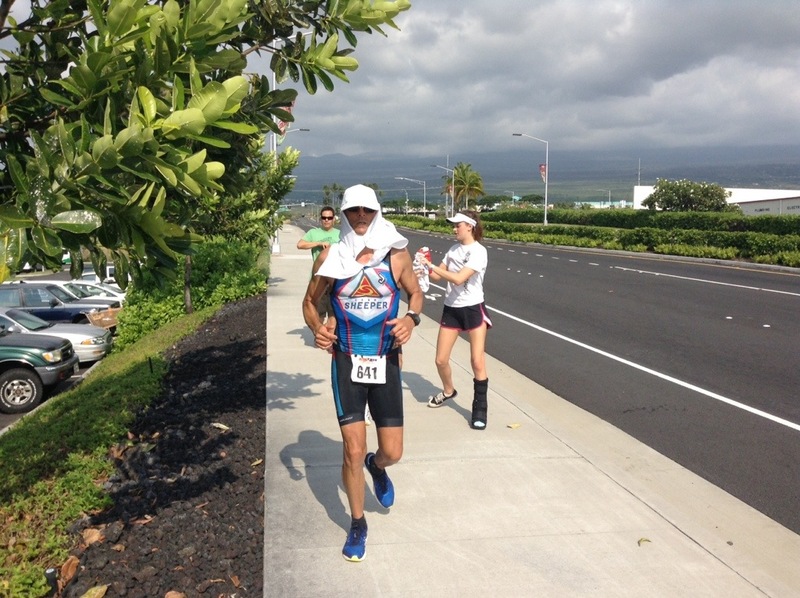 Things started to get tough at around mile 16 before Kawaihae – he developed a nasty blister on his foot. We sat him down and lanced the blister, put second skin and Aquaphor on it, and changed socks and shoes. That didn’t solve the problem, so we bought duct tape in Kawaihae and put that on. 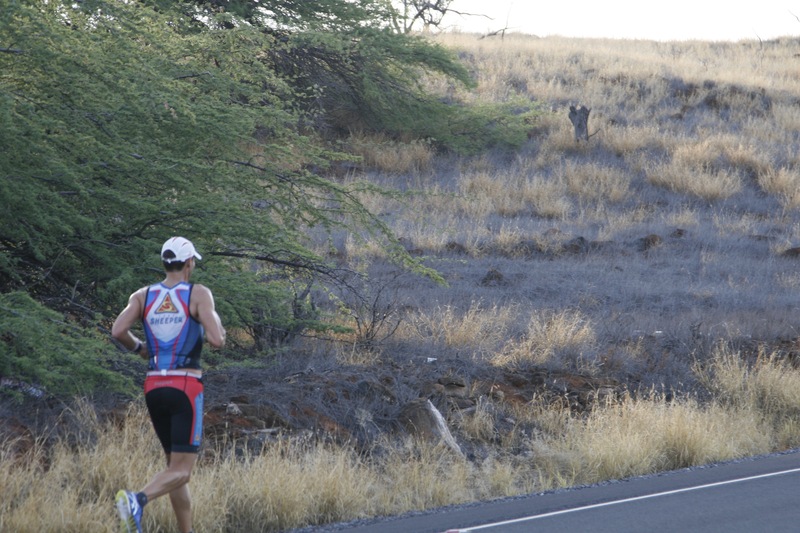 We started pacing him at Kawaihae for short stints, but on one of mine it became clear that he was going to need a pacer from there on in. So I prepped myself to go as long as I could. He passed the halfway mark in around 3:38 – we then sat him down and lanced the blister again and put more duct tape on. I then became fulltime pacer and water carrier (actually, ice in one bottle and sport drink in the other; shot blocks in the pockets). The goal became to just keep moving, and I had to make sure I didn’t let his walking breaks last very long. We switched from Sprite to Coke at mile 40 but switched back around mile 45 because the Coke wasn’t agreeing with him. It was also getting quite hot out. Part of the pacing change of plans was that I wasn’t really fully prepared to go for an entire marathon myself — I didn’t pay enough attention to my own nutrition and cramped badly at around my mile 20.5, so at my 21 (47.2 for Tim, I handed pacing duties over to Bruce, and he brought Tim home. The second marathon was not quick — around 4:51 — but it could have been much worse if not for Tim’s grit and determination. It was just a “git ‘er done” day. At no point in the time I paced him did Tim care or even want to know about his place vis-a-vis anyone — he just wanted to get to the finish, and he went to the well to do that. 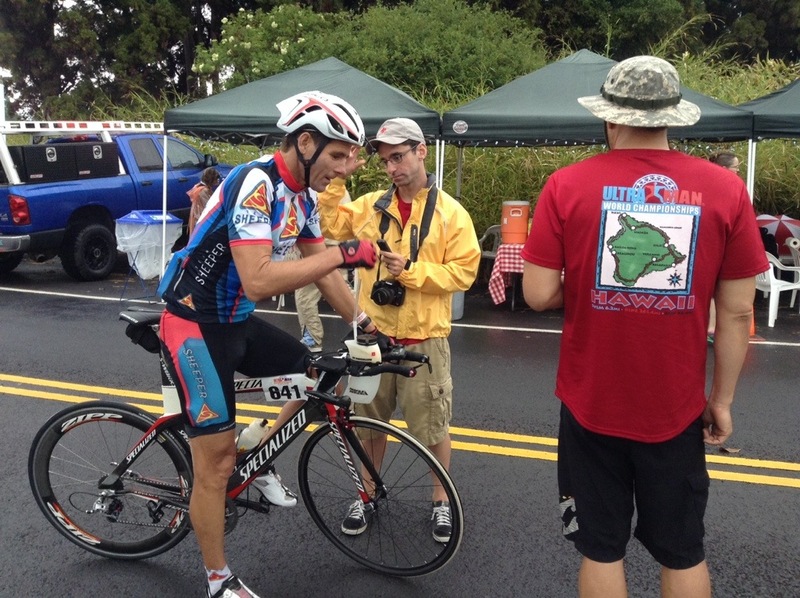 His official time was 8:29:40, and the three-day total was 24:57:12, good for 4th overall. Very impressive ahead of Tim in 3rd was Hillary Biscay, who ran superbly (and quite evenly), and almost reeled in Ribeiro in the overall standings. Next Post → Aggressive Drivers: Time for a “Page of Shame”?